For the swearing-in of the new NDP government last May 24, provincial Chief Justice Catherine Fraser performed the ceremony on the steps of the Alberta Legislature. Beside her was a grandfatherly looking gentleman in a dark suit. His crossed legs exposed the briefest glimpse of personality—argyle socks, albeit black and white. As each minister was sworn in, he stood, shook their hand and then sat to sign the Executive Council Roll Book. He clapped a couple of times but not enthusiastically. He didn’t seem to know what to do with his hands when the crowd went wild. This man was Richard Dicerni, the head of Alberta’s civil service. 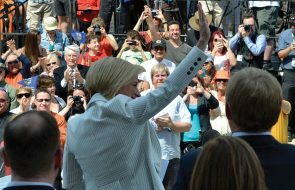 Alberta’s code of conduct contains that expectation: “The people of Alberta have a right to a public service which is conducted with impartiality and integrity.” Political parties come and go, but the non-partisan civil service, with its institutional memory and experienced staff, remains in place to work for whatever party happens to be in power. In our province, however, parties come but don’t often go. Alberta’s Progressive Conservatives stuck around for almost 44 consecutive years—a record for any government in Canada. After last May’s election, many observers feared that the NDP would inherit a civil service not only tainted by PC ideology but hostile to the new government. For years, PC premiers routinely politicized all levels of the government, appointing, for example, party constituency association presidents and former candidates to public bodies such as agencies and commissions. Klein’s abuse of the Public Affairs Bureau was a classic example of government interference in the civil service, a blatant effort to turn the civil service into servants of PC ideology. In 2009, during an economic downturn, Ed Stelmach also took aim at public servants. “Salaries for civil service managers will be frozen for two years,” he announced, “and we will be asking the entire public sector to share in this effort.” Alison Redford had barely sworn in her cabinet in 2011 when she purged nine deputy ministers. Relations between Redford and the civil service hit bottom in 2013 when she attempted to unilaterally freeze the wages of 22,000 members of the Alberta Union of Provincial Employees (AUPE). By then the civil service was in turmoil. Many observers feared that the NDP government would inherit a civil service tainted by PC ideology. A report in the summer of 2014 from Alberta’s auditor general, Merwan Saher, showed that several MLAs had taken government flights to PC party events, including a Grande Prairie leader’s dinner, a PC board meeting in Red Deer and a PC golf tournament in Lethbridge. The report raised questions about whether staff who book MLAs’ flights could differentiate party interest from public interest. When Jim Prentice became PC leader and premier that September, he discovered that the senior civil service was demoralized. Staff problems, he said, were reflected in a “shockingly high” turnover rate. He established a Premier’s Advisory Committee on the public service. 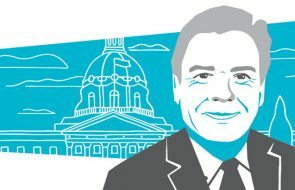 In an interview with the Edmonton Journal, Prentice said “I was surprised when I stepped in as premier the extent to which [the civil service] needed repair work.” He spoke of just how shell-shocked senior bureaucrats had become from dealing with what Saher famously called “the aura of power” around the premier’s office. “People had been cowed,” said Prentice. “I have something called a weekend-reading binder. …I was receiving five or six hundred pages of basically information and no advice. People were fearful of providing advice.” In the words of one senior bureaucrat, civil servants had “turned turtle,” afraid to stick their necks out for fear of having them chopped off. The person put in charge of Prentice’s advisory committee was Richard Dicerni, 66, a respected career civil servant whom Prentice had coaxed out of retirement in Ontario. He became Alberta’s top civil servant: the deputy minister to executive council. Prentice’s olive branch began to wither with the precipitous drop in the price of oil. A $7-billion “hole” in provincial revenues prompted him to take aim at public sector workers. In speeches leading up to the election, Prentice said Alberta’s civil servants were “among the highest paid public-sector professionals in Canada.” He claimed their wage hikes of $2.6-billion over three years would strain the treasury. To come up with that figure he lumped together every public sector worker, including teachers, nurses and prison guards, not just the 27,000 Albertans in the civil service—the core group of senior officials, managers and staff working in ministerial departments. When Prentice called an early election, only one of the main parties promised to protect public-sector jobs: the NDP. When Prentice lost the election, his plans for the civil service, good and bad, were derailed. Klein “re-engineered” government by cutting 10,000 civil service jobs and politicizing the public service. After the election and before the new government was sworn in, the media briefly thought they had something that supported the idea of civil servants doing favours for their old bosses. Word leaked about a mass shredding of confidential emails and memos, a charge that implicated not only political staff but also non-partisan civil servants. Though Notley was not yet sworn in as premier, she asked the head of the public service to stop all shredding, which he did. Alberta’s public interest commissioner, Peter Hourihan, and privacy commissioner, Jill Clayton, held a joint news conference to announce an investigation into specific allegations of illegal shredding at Alberta Environment. “We received an anonymous complaint,” said Hourihan. While the investigation continued, the government allowed shredding to resume in other departments after determining that the activity was mere housekeeping, the disposal of files deemed redundant or merely personal. Those fishing for signs of the civil service covering up the sins of the PCs or trying to hamper the NDP had come up empty. Notley was also aware that Dicerni was one of Alberta’s few senior civil servants with experience of transitions of power. Dicerni had been a deputy minister in Bob Rae’s NDP government in Ontario when it was replaced by Mike Harris’s Conservatives. Dicerni survived a purge of deputy ministers and worked not only for Harris but for eventual Liberal premier Dalton McGuinty. Later, as deputy minister at Industry Canada, Dicerni met Jim Prentice. Notley’s first impression of Dicerni came late in the 2015 election. 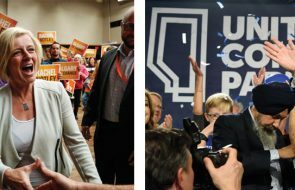 “He and one of his deputies reached out to our campaign a few days before the election itself to say, ‘Let’s talk about transition,’” Notley said in an interview with Alberta Views. Dicerni was displaying a keen understanding of the role of an impartial civil service by making a courtesy call to let Notley know the bureaucracy was there to help. Dicerni also had senior civil servants study the NDP platform to look for issues facing the potential new government. They spotted a pothole: Notley was promising more money for education after Prentice had announced cuts in the provincial budget on March 26. Alberta’s school boards trying to prepare end-of-May budgets were caught in the tug-of-war. After the election, Notley took Dicerni’s advice and extended the deadline for school board budgets by a month, allowing her time to put new school funding in place. Like any civil servant, Dicerni’s job is to give advice and help the government turn policy into practice but also to keep a low profile while doing so. Behind the scenes, Dicerni had the confidence of most everyone. “He’s been very helpful,” said Notley. “He’s worked under a lot of different parties in government. So he can bring different perspectives to it. But he is also very experienced in running the public service. That was a good choice on Prentice’s part, and we’re very pleased to have his wisdom at our disposal.” Notley said Dicerni can stay as long as he likes. But Dicerni is unlikely to stay long. His family, including four grandchildren, live in Ontario. It is only a matter of time until he will need to be replaced. Shortly after being sworn in as premier, Rachel Notley called an emergency meeting of top civil servants. She wanted advice. Notley and her ministers had officially been on the job for two days, and forest fires were burning out of control near Cold Lake, forcing energy companies to shut down almost 10 per cent of Alberta’s oil sands production. One of those attending the meeting was the newly minted Municipal Affairs and Service Alberta minister, Deron Bilous. When they were called to the meeting, the civil servants thought they were going to be fired. The questions caught Bilous off guard. “I was surprised to learn that this sharing of ideas hadn’t been the practice leading up to this,” he says. “It was explained to them that we just wanted to hear their thoughts and advice.” After all, that is the job of the civil service under our Westminster model of governance. That view was given its first test when Notley reversed Prentice’s cuts to health and education and cancelled PC plans to close the Calgary Young Offender Centre. A former PC cabinet minister, speaking on condition of anonymity, said that some in the civil service weren’t happy with the changes but made them quickly and smoothly. Neither did they grumble in public. The reluctance of civil servants to gripe in public is one of the difficulties facing news media investigating the NDP government’s relationship with the civil service. Though public servants are encouraged to give what Dicerni calls “fearless advice,” they do it behind closed doors. My interviews with senior officials in both the political and bureaucratic sides of government consistently showed no signs of a problematic loyalty to the previous ruling party. Instead of encountering hostile, ideologically tainted bureaucrats, I was hearing about civil servants who were “excited” about helping with the transition of power. Smith believes the NDP government doesn’t want to reopen the issue of public sector pension reform, something Redford tried to do before Hancock took over as premier and reversed direction. Smith helped lead the public-sector backlash against Redford’s proposal, and that has coloured his impression of some senior civil servants, who he said seemed to relish putting the screws to union members. Smith thinks there might still be changes among senior mandarins once the government has had time to discover which ones aren’t adjusting well. Smith is hopeful the system of governing Alberta will change. Even though he says he won’t go easy on the government during new rounds of contract talks, he is more confident than ever that his members will be treated with respect. Alberta’s Official Opposition, the Wildrose, is worried that not all the changes will be for the better. They point to John Heaney, a Victoria lawyer with deep connections to a previous BC NDP government, whom Notley named to her transition team in May. In June she appointed him associate deputy minister of policy and planning. After having told critics that his job was temporary, she announced in August that Heaney would be staying on in a newly created job: Deputy Minister of Policy Coordination in Executive Council. This puts Heaney in a powerful position near the top of the civil service, in the same office as Richard Dicerni. Since Dicerni is not staying on indefinitely, the opposition has speculated about Heaney’s future. Might he replace Dicerni? Jean points to last September, when an all-party committee voted for a 7.25 per cent salary raise for independent officers of the legislature (the auditor general, the chief electoral officer and so on). NDP officials said their party’s MLAs, who supported the increase and formed the committee’s majority, had been following the advice of senior bureaucrats who told them the hikes were fair and routine. After a public outcry, the NDP members reversed course and trimmed the hike. Graham Thomson is a long-time reporter with the Edmonton Journal, specializing in covering the provincial government.